Dr. Mody completed her training and research in the United States at the University of Illinois at Chicago (UIC), after which she practiced as an OB/GYN faculty member at the University for six years. In addition to the medical and surgical care of patients at the University Clinic, she had additional responsibilities for providing surgical training to medical students and residents. Dr. Mody has also previously practiced medicine overseas after her MD and OB/GYN residency at LTM Medical School in Mumbai, India. She moved to Greensboro with her husband in 2010 and loves everything this area has to offer including the climate, natural beauty, and warm Southern hospitality. She enjoys traveling, painting, reading, and cooking. 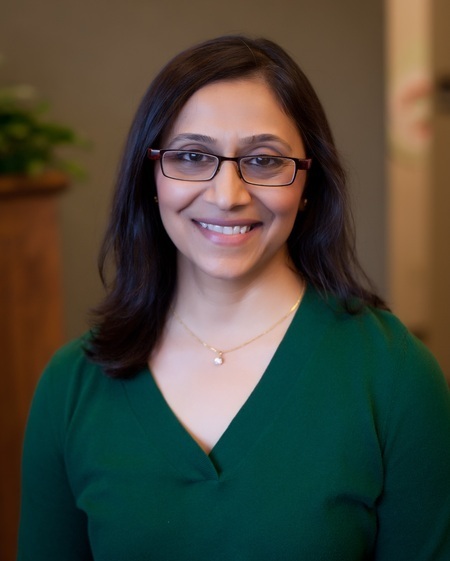 In addition to English, Dr. Mody is fluent in Hindi, Gujarati, Marathi, and medical Spanish. Dr. Mody performs robotic gynecologic surgeries for benign gynecologic problems and has a special interest in urinary incontinence in women. What patients are saying: "I have recommended your practice to several several women of varying ages. I always feel the setting is calm, professional -caring but at the same time clinical in terms of tending to one's health needs. It's a nice balance of empathy and work. No complaints from me! And Dr Mody is absolutely the best, I wish all my specialist docs had her manner and her level of interest. Thx." "My last pregnancy was through another practice in town and I wasn't pleased with them. This pregnancy was handled by Dr Mody who made me feel so comfortable and explained everything with such detail. I never left an appt with any questions unanswered. Dr Mody is so amazing and I'm so happy I was referred to her by my neighbor. I have recommended her and your facility to several other women. Thank you for everything!"